Robbie Willmott, the scourge of Teesside, has committed his football career to promotion-chasing Newport County. Essex-born Willmott scored his first goal of the season during County’s 2-0 FA Cup win against Championship club Middlesbrough in midweek – and has signed a two-year contract extension to stay at the club until 2021. Manager Michael Flynn was overjoyed the winger has signed his new deal before County play promotion-chasing Mansfield Town at home on Saturday. 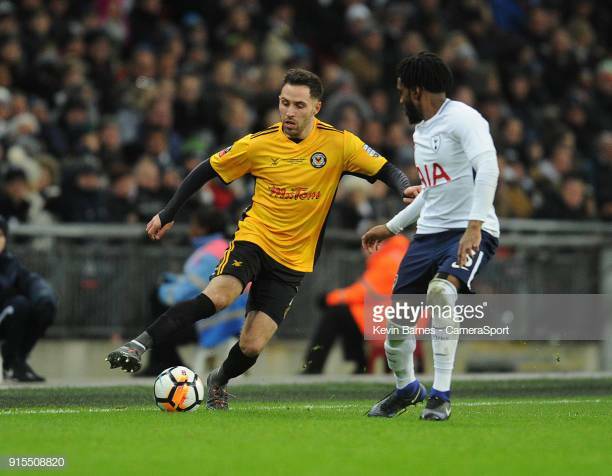 Willmott has made more than 150 appearances for Newport in two spells, helping them to promotion back to the Football League in 2013. Flynn’s delight at securing Willmott for the next couple of seasons cannot hide frustration at the stark contrast between FA Cup and League Two form. County swept aside Leicester and Middlesbrough in the cup, but have earned one win and six points from a possible 30 in their last 10 Football League fixtures. They failed to score in four of those matches, netting eight goals and conceding 17. Welshman David Pipe is at a loss as to why the Exiles produce contrasting performances, saying: “You can’t explain it. ⚽️ Goals against Boro, Leicester, Wrexham and Met. Police in the #FACup. 😎 And 11 more in the league. “I suppose it’s easier when you have 6,500 fans in the ground, and whether or not the boys would admit it, there is a bit of pressure off when you play in the cup, especially against a higher-level teams. Manager Flynn says he won’t be rotating players for Newport’s home League clash with Mansfield at Rodney Parade even though they entertain MK Dons on Tuesday and then face Manchester City in the FA Cup. He was criticised after resting Mark O’Brien, Dan Butler and Padraig Amond at Grimsby when Newport crashed to a 3-0 defeat. “I had to rest a few players to make sure they could last, because I knew the conditions would be tough against Middlesbrough,” said Flynn. “I won’t be doing that again. I will never put my own ego or my win ratio before the best interests of the football club. “So, for those who don’t quite get it, this football club is much more important than Michael Flynn or any other individual. “And I think I’ve been proved right in the way they lasted in the game against Boro in difficult conditions. Mansfield are the form team in League Two, having lost the least number of matches of any side in the division. The Nottinghamshire club have suffered three defeats – only one of those in an away fixture. Mansfield are two points behind leaders Lincoln City having played a game more.